The Tri-Cities region is situated in the Northeast Corner of Metro Vancouver. 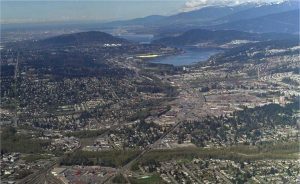 It has ready access to downtown Vancouver’s business district, which is approximately 30 kilometres west of the region’s centre. It is also linked to other municipalities by a network of highways, a rail transport system, and a SkyTrain line extension completed in 2016. The Cities of New Westminster, Burnaby, Pitt Meadows, and Surrey lie adjacent to this region, and the Canada-United States border is located roughly 30 kilometres to the south. The Vancouver International Airport (YVR), the second largest airport in Canada, is located about 40 kilometres west. The Abbotsford International Airport (YXX), situated in the Fraser Valley region, is located about 50 kilometres east. The Tri-Cities region is also located conveniently close to the Swartz Bay and Horseshoe Bay ferry terminals, providing access by sea to Vancouver Island and northern BC. The mild climate present in the region keeps locals comfortable year-round. At the same time, each season is distinctly different, offering fresh opportunities for recreation as the weather changes. TransLink is a transportation company that delivers a wide range of services and programs to provide for the transportation needs of Metro Vancouver residents and businesses. More than just operating the bus, SkyTrain, SeaBus, West Coast Express, and HandyDART networks across Metro Vancouver, TransLink also has a hand in improving road and bike networks across the region. TransLink has begun aiming its focus on the Tri-Cities over the past decade, completing major infrastructure projects like the Evergreen SkyTrain extension in 2016. The company has also deepened the bus network running between each city, providing locals with viable, eco-friendly alternatives for their daily commutes. For a list of transit maps encompassing key areas in Metro Vancouver, click here. The goal of a transportation plan is to guide the development of pedestrian, bike, road, and transit networks through the implementation of different projects and policies. While these plans are normally carried out over multiple decades, each of the Tri-Cities are committed to revising their own plans as they go, taking into account changes in factors like public opinion, financial stability, and development trends. Click the links below to view each city’s transportation plan.